If something falls out of the sky into my yard and lands at my feet, is it wrong to keep it? That is the argument Doc and I had the other day. I will tell you what happened and you can decide for yourself. It was one of those beautiful spring days and I was lying in the lush green grass minding my own business. Plop! Out of nowhere a neon green orb falls out of the sky and lands right at my feet. After I recovered from being startled, I realized it was one of my most favorite things in the world, a tennis ball. As I was picking it up to play, I saw the neighbor dog and his owner coming toward the fence. The man called me over to try to get the ball. He said it was his and had thrown it so hard it had landed in my yard. “No way” I thought. “It’s mine now”. So every time they came near me I ran away until they finally gave up and left. What I didn’t realize is that Doc had been watching out the window the whole time. It was a long, silent walk back to the house. I have learned it’s best not to argue with Doc when she is upset with me, but I guess she is right. I wouldn’t like it if someone came across my stuff and just kept it. 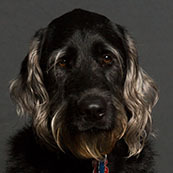 Chalk it up to another lesson learned in this dog’s short life. I have received some more letters that I want to share with you. I am at my wit’s end. No matter what I do, my dog Trixie gets into the trash. I have tried hiding it in the cupboard, but she opens the door. Putting a lid on it doesn’t help, she takes it off when I’m not looking. It’s not like I don’t feed her. Please help, I am tired of coming home with trash strewn all over the floor. For a dog, the trash can is like going to the nearest fast food restaurant. Not knowing what we will find, we keep coming back, hoping for a big score. Even the stinky smell doesn’t deter us. I guess there’s no accounting for taste. For dogs, eating junk is just part of our evolution. To bring back some peace into your house, I suggest that you keep the trash in a place that Trixie can’t get to, like the garage or you can get a garbage can with a spring lid. That’s what Doc uses and I’m afraid of it. Take as many precautions as you can, dogs are and always will be scavengers. My dog loves to dig holes all over the yard. Why is he doing that and how do I get him to stop? It’s driving me bananas. I would appreciate any suggestions you may have. You have come to the right person. As a reformed hole digger myself I can help you. Doc had to figure out why I was digging to get me to stop. Being the sleuth that she is, she figured out I was just trying to get comfortable in the yard, by digging holes to lay in and stay cool. (She was right!) Instead of letting me dig up the whole yard she re-directed me to one spot, behind the bushes where I can lay in my dirt hole and stay cool. 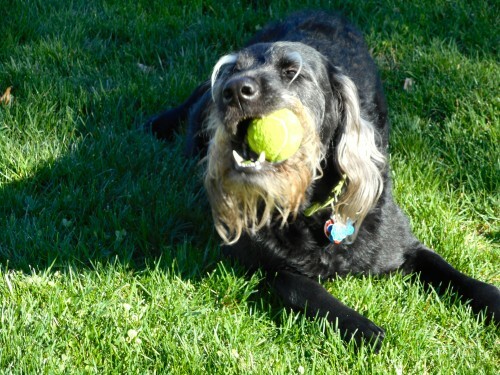 The way to redirect your dog is to start by choosing a place in the yard you don’t mind having a hole. Then, bury something in the spot and when he starts digging cheer him on. We love praise and will get the message. If he goes back to the old holes, do what Doc did, booby trap them with some rocks and a little ground red pepper on top. That worked on me. Good luck! They say you died before I was born, but I don’t believe it. That being said, I have my own theories. I agree with the humans that believe you may have staged your own death because you got sick of all the limelight and lack of privacy. I imagine you quietly living out your senior years, on a remote island somewhere in the Indian Ocean. Dressed only in a Speedo, your grey hair blowing in the breeze, you spend your time like the old high school football star, remembering your glory days by watching all your old cheesy Elvis movies and your concert tapes. Or, my second theory is that you did die and you have come back as a Zombie. People will certainly leave you alone if you are a Zombie. Think of the possibilities! You could start a whole new career as an extra on the TV show The Walking Dead. Quietly you would suggest to the director and the writers of the show the possibility of introducing an Elvis Zombie look-alike. Elvis Zombie could sing old Elvis tunes that lull the living into letting the Zombies eat their brains. Fabulous! (It’s ok with me if you use my idea). Just so you know, lots of people are still making money off your image and all your music. Why, they even have opened up your old house Graceland to tourists that traipse through all the rooms, looking at your stuff. Some fans stand outside the gates and cry, they miss seeing you so much. 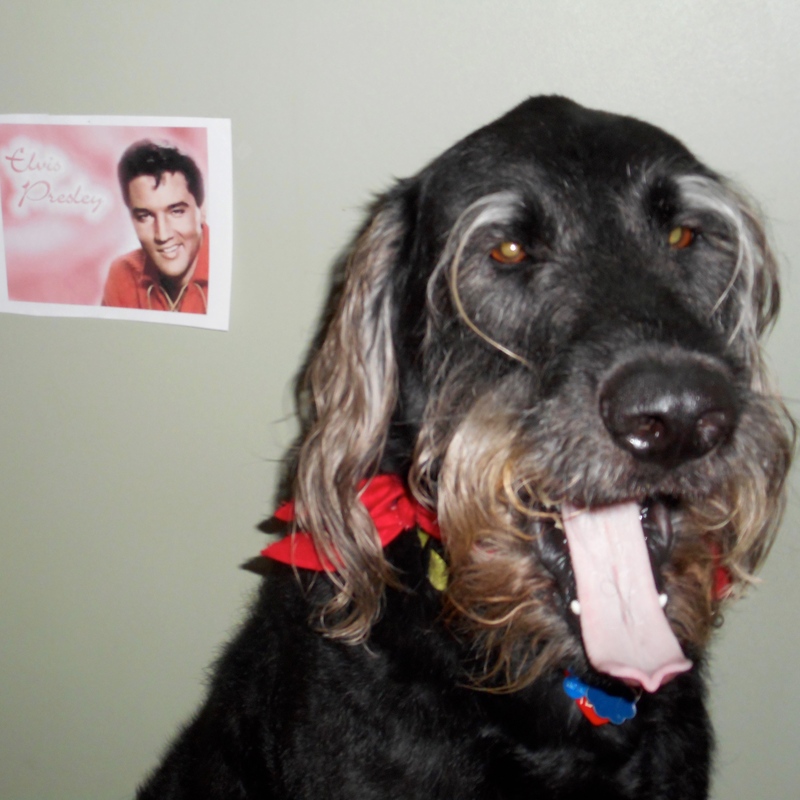 Do you know about all the Elvis impersonators? If you do, that must just get your goat. Some of those impersonators even have their own female groupies that act like they are the real Elvis. I have watched those women rush the stage and throw their undies at those fakes. How Rude! Well Elvis, that’s all I have to say for now. Doc says it’s getting late and it’s time for me to go to bed. I just wanted to drop you a line and tell you that wherever you are, in heaven or on earth, I hope you are at peace. You left us with some great music that has touched even my little doggy heart and I just wanted to thank you. Take care. Doc recently told me a story about her childhood that really made me think about my own life and the fears that keep me stuck. I thought I would pass the story on to you. 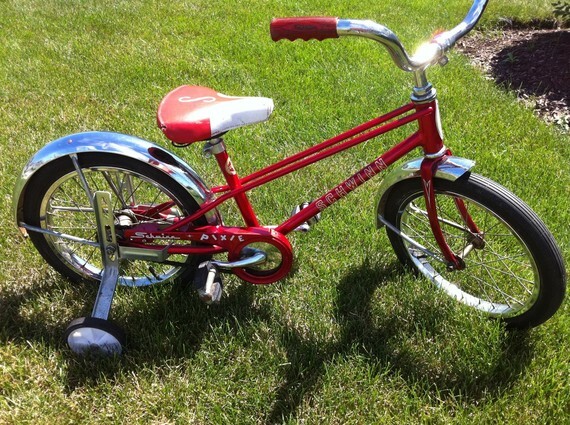 When Doc was six years old, she got a shiny red Schwinn children’s bike for her birthday complete with training wheels. Doc was thrilled. She rode that bike up and down the long driveway at her house for hours every day. What a metaphor for life, I thought, as she finished the story. How many times do we keep our training wheels on long after we really need them just because it feels safer? Doc has always encouraged me to do things when I was afraid just like her father did with her. It’s so important not to let fear define your life. So the question I leave you with today is; What would you do if you were not afraid? Maybe it’s time to remove your training wheels.